Following on from the previous page, after the crash it was a couple of months before I started the rebuild, obviously it needed a completely new front end. Its amazing how quick a burning torch and a grinder will give you a fresh piece of canvas to work on, so to speak. The frame section was replaced like for like, keeping the stearing angle the same, because it worked well before. The leading link fork design changed a bit, this time I used a bike swinging arm, it was just the right size and heavy enough for the job. I used a Triumph Bonnie rear wheel hub with double discs and lockhead calipers, and had a 15" car rim wrapped around it. 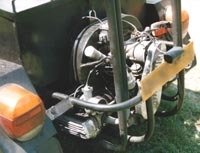 The swinging arm attached to a single fork, made from 150 x 50mm box section steel welded to 1" yokes, with bracing to spread the loads. To smooth out the bumps I use a single shock absorber, this time mounted centrally. This worked a treat, and the double discs up front gave it real stopping power. 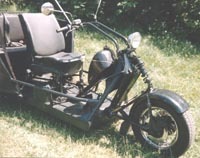 I built in new tubes at the side running the length of the trike, a bit of side impact protection. 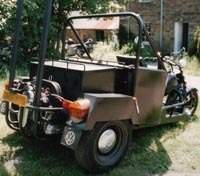 The engine cage protection bump bars, and the large storage box were made on its first build. New handle bars were made for this version of the trike. 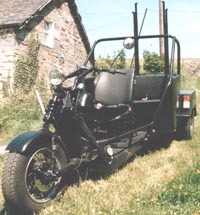 The trike was sold on after a few more months of use.